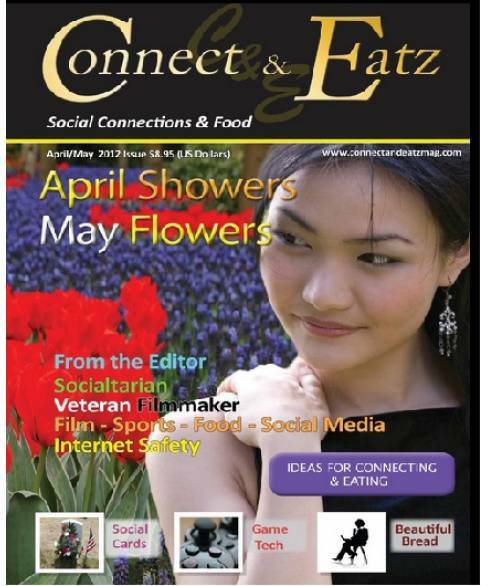 Connect and Eatz magazine is one of the first magazines dedicated to social media, social networking and a persons life around it. With 100's of dollars in value per issue, free videos, downloads, products, events and more. Finding solutions to the challenge people and business face in dealing with the social networking world. It provide the ulitmate informative and entertainment platform to our readers and users. To inform, education, assist, and entertain all of our readers through service projects, parties for our readers, assistance for our readers needs, educate them in the variety of topics that are generated from the use of social network platforms within our daily lives. Subscribe or renew your Connect and Eatz magazine subscription now and save 35% off. For only $107.40 receive 13 issues of articles covering Enrichment delivered to your home on a Monthly basis. Renewals to Connect and Eatz will be added to your remaining issues of your current subscription and extended. Some Quick Facts About Connect and Eatz Magazine! Auto-renewals: NO AUTO-RENEWALS when you order your subscription to Connect and Eatz with us! Q. Can I Renew My Subscription To Connect and Eatz Magazine? You can renew your subscription to Connect and Eatz online by selecting the number of years you would like to renew and select 'renew' option above. Enter the mailing address as it appears on your current issue of Connect and Eatz and your renewal will be added to your existing subscription. Please expect to see the new expiration date on your current cover of Connect and Eatz magazine within 8 to 10 Weeks of placing your order. Since we do not auto-renew, we recommend renewing at least 8-12 weeks before your subscription expires. Q. When will my first issue of Connect and Eatz start? Connect and Eatz magazine is published 13 times a year; hence your first issue will start in approximately 8 to 10 Weeks. Why? This is because when we receive your order, it takes about a week for your subscription to be received and scheduled by the publisher. It will then be included with the publisher's next production cycle and shipped to you via standard mail. Q. How can I change my address for Connect and Eatz magazine? Changing your address can be done easily online by first logging into your account. Then go 'My Active Subscriptions,' click on address change link next to your magazine and enter your new address. That’s it! If you did not order from us, please contact Connect and Eatz publisher by following the Magazine Subscriber Services link above for the 1-800 number or online support. Q: How do I report a missed issue of Connect and Eatz? If you have missed any issue of Connect and Eatz, please let us know and we will extend your subscription by the number of issues missed and also find out if the post office is having any problems delivering your subscription. Note that Connect and Eatz magazine is published 13 times a year therefore a Monthly publication. Q. Where can I find my expiration date for Connect and Eatz? The month and expiration date (month/year e.g. Dec18) of your Connect and Eatz subscription can be found on your magazine label above your name on the right. Q. Do you have any coupons for Connect and Eatz magazine? We currently offer Connect and Eatz magazine at a discounted rate of $107.40 for a full year subscription. That is 13 issues total at a 35% discount off newsstand price. Please use coupon code 5ORDER for an additional 5% off your Connect and Eatz order today. For additional Connect and Eatz subscription deals and promotions if available, please join our mailing list below to be notified. If you received an offer for a lower price than what is on our website, simply email us the details. All our prices are the lowest publisher-authorized prices for Connect and Eatz magazine and we will check to ensure accuracy of what is listed on our site. Q. In what format do digital subscriptions of Connect and Eatz come in? Full access to the digital version of Connect and Eatz magazine will be delivered via email within 4-6 weeks. You can view your digital issue via iPad, mobile device, desktop etc. just as you would with any web page. If available, the option to order a digital subscription is under ‘Options.’ Simply select 'Digital' and proceed to checkout. Q. I renewed my Connect and Eatz subscription but received a renewal notice in the mail. Why is that? Renewal notices are automatically mailed out by the publisher 8 weeks or even 16 weeks before your Connect and Eatz subscription expires. The notices might also come from other companies soliciting subscriptions. Unfortunately we have no control of that. However, if you ordered from us, simply ignore the notices since you do not owe anything! Q. I no longer want to renew my Connect and Eatz magazine. Why do I keep receiving bills? If you ordered your Connect and Eatz magazine from the publisher with the auto-renewals or 'bill me later' option, you might be obligated to pay the invoice as part of their preferred continuous service unless you cancel. To call Connect and Eatz and cancel or ask them to stop sending you invoices, please go to Magazine Subscriber Services for publisher customer service. If you ordered from us, simply ignore the reminders since we do not offer auto-renewals or mail out bills or invoices. Q. I would like to give Connect and Eatz as a gift. How can I do that? You can order a gift subscription by following the Give a Gift Subscription link above to be taken directly to Connect and Eatz gift page. To cancel your Connect and Eatz magazine,simply go to Magazine Subscriber Services link above for publisher customer service --both by phone or online. The publisher might have information on where the subscription originated from. Remember, Subscribe Renew does not send out unsolicited subscriptions or free trials however, if you feel this might be a gift from someone, email us and we will find out if it was ordered from us and provide you with the gift giver details. Q. I received Connect and Eatz magazine and I really don’t like it. Can I replace it for another Magazine about Enrichment? Q. I currently read Connect and Eatz magazine would like to write a review. How can I do that?